Geocaching HQ encourages geocachers to find at least 20 geocaches before setting out to hide their own geocache. The greater variety of geocaches that someone finds, the better they will understand how to create an enjoyable experience for other geocachers. Find additional guidance about hiding caches in the Geocaching Help Centre. For publication, geocaches must follow the Geocaching Guidelines. For caches placed in Ontario, Canada the items listed below also apply. Reviewers do not have the ability to adopt/transfer ownership of a cache page from one Player account to another. Only the owner of an active cache page can initiate an adoption request to another Player by visiting http://www.geocaching.com/adopt . Geocaching HQ will not process an ownership transfer of a cache page without written permission from the cache owner or their estate. Archived cache pages cannot be adopted. Click here to visit the Geocaching HQ Help Centre Article - "Hiding A Geocache - Challenge Caches"
Click here to visit the Geocaching HQ Help Centre Article - "Hiding A Geocache - Challenge Checkers"
Click here to visit the Geocaching HQ Help Centre Article - "Hiding A Geocache - Challenge Cache Subjectivity"
On May 25th 2016, Geocaching HQ announced the end of the moratorium on Challenge Caches in the Geocaching Blog. Items listed below with bullet points are direct quotes from the Geocaching HQ articles above; text in bold has been provided by the Ontario Reviewer Team as clarification. "Challenge cache owners must demonstrate that there are plenty of qualifying caches to meet the challenge at the time of publication." "If only a few people can find and log a challenge cache, then it’s almost like a private cache. (And private caches aren’t permitted on the website)." If there are a limited/restrictive number of qualifying caches available for a Challenge cache, it may not be Geocaching Guidelines compliant. "Challenge cache owners must show that they have met the challenge." “A challenge cache needs to appeal to and be attainable by a reasonable number of cachers. Your reviewer may ask for a list of cachers from your area who qualify." The Ontario Reviewer Team consider the "reasonable number of cachers" to be 10; those qualifying cachers should be based within Ontario. "The container must be placed at coordinates on the listing, either as posted coordinates, or as a visible additional waypoint." The coordinates of the cache container for a Challenge cache must be visible on the cache page; Challenge caches must not have a puzzle element or hidden waypoints. "Difficulty rating (should) be based on the challenge, the terrain rating on the challenge cache location." The terrain rating of a Challenge cache should be rated as if it were a Traditional cache in the same location. "Challenge caches published after April 21, 2015 must include a link to a web-based challenge checker. At this time, Project-GC is the only website approved to host challenge checkers." All Challenge caches must have a unique Project GC challenge checker, even if qualification can be verified by visiting the profile page/statistics of a Player. Proof of qualification in a log (e.g. GC codes or bookmarks of qualifiers) should not be requested for a Challenge cache published after April 21, 2015. The onus is on the cache owner to verify that those who log the cache as found have indeed met the qualifying requirements, using the Project-GC Challenge Checker. "Challenge caches are sometimes difficult to review for publication due to the subjectivity involved. Meaning, one person’s opinion can differ from anothers, which can cause issues in the review process. One of the major goals of the 2016 guideline update for challenge caches was to reduce some of that subjectivity. However, we can’t completely remove subjectivity from the process." the approach to Reviews has been considered to be "provincial", not "regional" - as the arbitrary definition of a region/area can also be subjective. Challenge caches may need to be relocated if another Challenge cache (in Ontario) is noted to be within 50km, as measured by Google Maps shortest driving route. Project-GC is a third party partner of Geocaching HQ; their Frequently Asked Questions (FAQ) page will answer many questions that relate to Challenge Checkers. Project-GC host a forum where Challenge Checkers can be requested - the Project-GC Challenge Checker development/tagging does not involve Reviewers! Project-GC request that every Challenge Checker have a unique "tag" that matches the GC code of the cache – for more information, click here. "Challenge cache owners are integral to the success of this framework. It’s important that they work within these guidelines in order to reduce the burden that reviewers felt prior to the moratorium. If after a period of evaluation we find that a lot of the pre-moratorium issues are still causing problems, then we’ll know that this new framework isn’t the answer. We don’t have a backup plan. The only remaining option would be to not permit challenge caches as they currently exist." The Ontario Reviewer Team are working through the new Challenge Cache framework, along with the Ontario geocaching community. The Geocaching Guidelines are revised by Geocaching HQ from time to time. With your constructive feedback - the Ontario Reviewer Team can not only provide Geocaching HQ with information for future Geocaching Guidelines consideration - we can hopefully improve our own approaches and processes, also. Determine the coordinates for your intended placement(s) before you hide any physical containers/items. Ensure that your proposed placement adheres to the current Geocaching Guidelines (don't forget the 161m saturation rule!). Review the Geocaching Help Centre and Getting Your Cache Listed Quickly for other placement and cache page considerations. Create a "placeholder" cache page; be sure to enter your intended placement coordinates (don't forget Additional Waypoints). Post an explanatory Reviewer Note - e.g. "CACHE NOT IN PLACE - PLEASE CHECK COORDINATES". Ensure your placeholder cache page is Submitted For Review. If there are any Geocaching Guidelines issues with your intended coordinates you will notified and your cache page will be Disabled by the Reviewer. If you relocate your placement, use the Edit link on the right of the cache page to update your coordinates. Submit For Review again - the Reviewer will again check to determine if everything is Geocaching Guidelines compliant. If a Land Management Policy is on record for your cache location, the Reviewer will refer you to the appropriate Land Manager Permission Process. Events often occur at venues which offer products/food and drink to patrons. Cache pages should not include recommendations, refer to venue features or emphasize available menu items as this could be interpreted as being promotional/commercial. A simple sentence such as "Food and drink are available" will ensure Attendees know when there are options. (Note: If Attendees have questions regarding an Event or what is offered at a venue, they always have the option to contact the Event Host via their Profile Page). Be listed with a Difficulty rating of 1. Be listed with a Terrain rating of 1 if they are wheelchair accessible. Be listed with a fixed start time and end time that appears in the descriptive text. Be listed with a minimum duration of 30 minutes (if an Event) or 60 minutes (if a CITO). Be submitted for review at least 14 days prior to the event date (21 days is preferable). Include a social element, coordinated by the cache owner (who will also maintain the cache page and logs). Be open to all - if a limited number of seats/space are/is available for attendees, those who wish to simply drop-in (and not stay) are also eligible to log the event. Be static and listed with fixed land/ice surface based coordinates. Require a log book - they may be listed with a clear mention of the log book being optional as there is no requirement to sign a log book at an event. Contain commercial, promotional or agenda based content. Restrict the number of attendees who can attend the event. Promote the finding or placement of caches. Be created to bring cachers to an existing event/gathering that would already be occurring if the event was not published on the Geocaching website. Imply the requirement to participate in extra activities (other than being at the event coordinates during the time window of the event) to log the event as Attended. Be scheduled on the same day as a local/regional Mega/GIGA event. Be held near transportation centres such as airports, cruise ship terminals or train stations. Include recommendations, suggestions, menu items or links to commercial websites, products or services. Mention the name of the event location (e.g. restaurant name) in the descriptive text of the cache page, not the cache page title. Include non-specific text indicating that food/beverages are optionally available at an event location. Include a link to an ad-free webpage or geocaching profile page where additional event information is provided. Include references only to trackables being available for sale if the trackables are specifically created for the event and they are trackable on the Geocaching.com website. Focus on teaching opportunities for the specific Geocaching API partners, GSAK and Project-GC. Removing garbage from a designated. This phrase refers to holding multiple events/CITOs that are close to each other or at similar times. Events are social gatherings of geocachers and having too many too close to each other diminishes their value to the community. An event host may be required to reconsider their event timing/location if an existing event occurs within a few hours of their proposed event. The Ontario Reviewer Team strongly suggest that the upcoming list of events are checked prior to any event cache page being submitted for review. The upcoming events for Ontario can be found by clicking here. "Events will be published within a similar time period only if they are more than 20 miles apart (as the crow flies). Events closer to each other than 20 miles will only be published if the end time of the first is more 10 hours before the start time of the next." At this time, the Ontario Reviewer Team prefer not to be as specific with distance or timing restrictions as there are seasonal/regional travel variables that need to be taken into consideration. As a rule of thumb, if it's possible to attend one event/CITO and then travel to attend another event/CITO in Ontario within a few hours... the events are probably stacked. Only Event (not CITO) Caches may promote other geocaching events. If a cache page is promoting another Event Cache, it cannot encourage the logging of Will Attends; this includes references such as "Don't forget to log your Will Attend". "Any mention of an event in a non-Event cache must be limited to one singular sentence similar to: this cache has been placed for the [insert name of Event here], placed at the bottom of the long description"
The Ontario Reviewer Team currently considers exceptions to this guidance by specifically allowing the singular sentence to include the name, date and start time of an event in a non-Event cache page with text such as "This cache was placed with the intention of being found for event/occasion on date/time". There should however be no implication of there being any penalty for those who choose to find/log a cache as soon as it has been Published as Published means ready to be found. It is also possible to make a Future Publish Request so that a cache is Published on a specific date. Cache pages that include a specific Publish date request should be Submitted for Review at least 14 days in advance. Requests for morning/afternoon/evening Publish on a particular date may be possible - however timing cannot be guaranteed. To help improve the overall caching experience, Geocaching HQ created an algorithm to calculate a hidden Health Score for each geocache. A low Health Score provides an indication that the cache may need attention from the owner. The goal is to improve the overall geocaching experience and avoid frustrations due to missing or broken caches. The number of "false positives" flagged with this process are minimal compared to the number of abandoned caches that this process will remove from the game. Before permission is requested from a Land Manager, you will need to check to determine if your coordinates are available. To obtain permission for placements in the area/site/properties listed below, refer to the appropriate site/contact/policy resources. Be sure to provide the coordinates of your physical placement(s) and your listing GC code to the site/property/land manager. Coordinates should be provided in DD MM.MMM or "GPS notation" - they should look similar to N? ?° ??.??? W0? ?° ??.??? (where ?s are digits from 0 to 9). 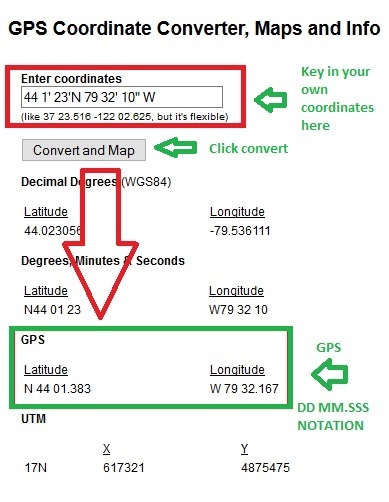 Need help converting your coordinates to DD MM.MMM GPS notation? Click here to visit an external/3rd party site that may help; click here to see an example. The permission e-mail must originate from the authority or agency responsible for the site/property. The e-mail must contain the GC code of the relevant cache page. The e-mail must include coordinates of ALL physical placements (e.g. permission is needed for each physical stage of a multi-cache). To avoid typographical errors, scanned images and photographs of permits should be avoided. Once permission confirmation is received, CacheDrone will paste the text of the permission e-mail on the cache page in a Reviewer Note. At this point you should make sure your cache is in place and ready to go! Ensure your cache page is accurate - post a Reviewer Note to indicate you are ready for the cache page to be published. When everything is ready to be found, Submit For Review! Placements on Canada Post property (e.g. mailboxes) can be considered mail tampering which is a Federal Offense. Permission from local Postmaster would be required. Geocaches can only be placed up to 2 metres on either side of a CLOCA designated trail. No geocaches permitted in ESAs (http://www.london.ca/residents/Environment/Natural-Environments/Pages/ESAs.aspx). No formal policy references have been made available. Permission must be obtained from the Park Superintendent for the specific property/site. If a cache is Archived due to a permissions issue, ongoing logging of the Archived cache may be viewed negatively by the Land Manager/Property Manager. If a Land Manager/Property Manager does not provide permission for a cache placement, the cache owner should arrange to retrieve all elements of the cache as promptly as possible. Natural gas tanks/meters, hydro-electric transformers, electrical substations, transmission towers and equipment with warning signage should be considered off-limits locations for cache hides. Canada Post Mailboxes, Super Mailboxes and all Canada Post properties should be considered off-limits locations for cache hides, unless written permission can be provided by the Postmaster. On/off ramps and roads/highways that only permit emergency stopping are not intended to be accessed by pedestrians; they are considered off-limits locations for accessing and hiding caches. Schools, playgrounds, daycare centres, airports and other locations where unexplained objects and/or visitors may be misinterpreted as security risks should also be avoided. Ontario - Published Means It Is Ready To Be Found! Cache pages should not include/impose restrictions (e.g. "Do not find this/this cache should not be found until after date/time") on when a cache is ready to be found. If you do not wish your cache to be found until a certain date, a Future Publish Request may be requested (see above). You may choose to include positively worded text on your cache page, such as: "This was placed with the intention of being found for event/occasion on date/time". The Rail Safety Group of Transport Canada regulates the railway industry in Canada. Section 26.1 of the Railway Safety Act makes it an offense to trespass on any railway lands in Canada. Caches that require access to and/or are situated near railway lines may be subject to additional scrutiny during the Review process. Cache pages should not include content that promotes the acquisition of social media channel subscribers/followers as this would be promoting an agenda/highlighting a cause. Linked media content on a cache page should be relevant to that specific cache. Geocaching HQ requires that cache pages that have links to social media groups also include a disclaimer; "As the geocache owner, I ensure that this links to a local geocaching group that is active in the community and contributing to geocaching in positive ways. This link has not been checked by Geocaching HQ or by the reviewer." All physical caches (Traditional, Multicache, Letterbox, Puzzle/Mystery and Wherigo) should be minimally comprised of a container and a log. Containers should be watertight and suitable for the hot/cold temperature extremes of Ontario. If a new cache page is submitted for review and it has a proximity issue with an unpublished ("Work In Progress") cache page, various factors are considered. A Work In Progress cache page may be ignored if appears it was not Geocaching Guidelines compliant at the time of the last known update. If six months or more has passed since the last posted log from the cache owner on a Work In Progress cache page, it will be ignored or archived. If 3 months or more have passed since the last posted log from the cache owner of a Work In Progress cache page, a Reviewer will request that an updated log be posted within 14 days, confirming that the cache page will soon be submitted for review. If the cache owner does not respond, the Work In Progress cache page may be ignored or archived. If a Work In Progress cache page is less than 3 months old, it is considered active. If a cache owner is informed that a location in unavailable due to a Work In Progress cache page nearby, they may relocate their cache elements, or submit their cache page again at a later date. * This page is always a work in progress. Objects in the mirror are closer than they appear. May contain traces of nuts. Do not use for drying pets. Leakage is neither expected or warrantied. Feb 10th 2017: Project-GC and GSAK related events are now publishable, as per Geocaching HQ! The local laws and guidelines for geocaching placement vary from place to place. As community reviewers learn geocache placement policies for a certain location, they can add it here. This site may not be a complete or accurate list of land policies. These policies are made by the land owner or manager, they are neither the reviewer’s nor Geocaching HQ’s. This guide is just for reference, if no policies for the area you’re looking for are listed, that doesn't mean no policies exist. You must still obtain permission to place your geocache from the landowner or land manager,comply with all applicable laws, and follow the Geocaching Listing Requirements. If you have an update, email the community reviewer(s) listed.